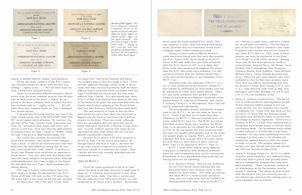 The cover and table of contents for Issue #26 are shown below. 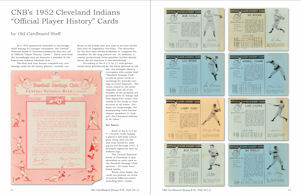 1) "CNB’s 1952 Cleveland Indians 'Official Player History' Cards" by Old Cardboard Staff. 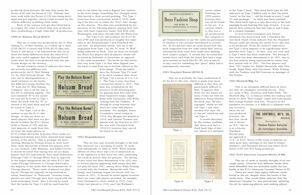 Until earlier this year, only a single player was known by the hobby for this 20-card set issued in 1952 by the Central National Bank of Cleveland. 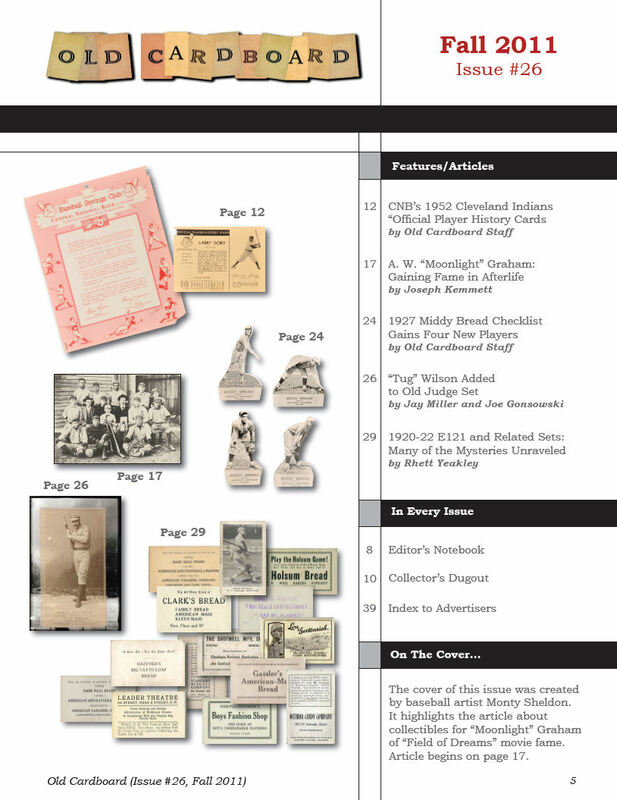 This all changed, however, with the discovery earlier this year of the entire set along with a promotional letter. The set is described along with a full gallery of all 20 cards. 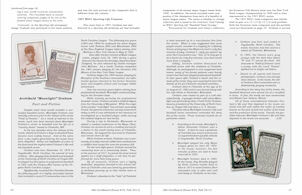 2) "A. W. 'Moonlight' Graham: Gaining Fame in Afterlife" by Joe Kemmett. 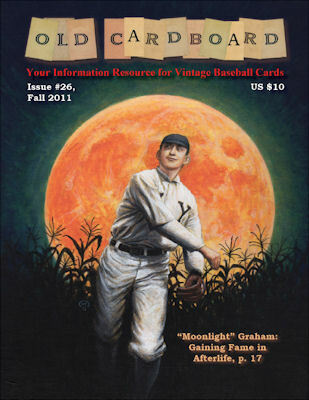 Made famous by the movie "Field of Dreams," New York Giants' outfielder "Moonlight" Graham lasted only five minutes in Major League play. 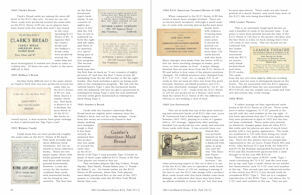 His few surviving collectibles (most only recently identified) along with a biographical profile of his life as a community doctor in remote Chisholm, Minnesota are described in this compelling article. 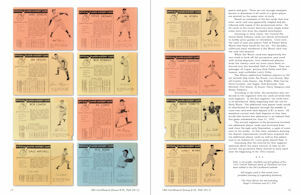 3) "1927 Middy Bread Checklist Gains Four New Players" by Old Cardboard Staff. 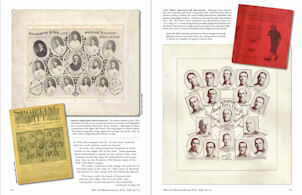 A brief description of this obscure set of 1907 cut-outs that includes only two teams. Focus is on four previously unknown players from a recent discovery that expands the set checklist from 44 to 48 players. 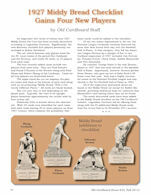 4) "'Tug' Wilson Added to Old Judge Set" by Jay Miller and Joe Gonsowski. 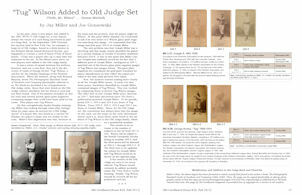 Two of the authors of the seminal reference The Photographic Baseball Cards of Goodwin and Company report the corrected identification of a new player from three previously mislabeled cards in the popular N172 Old Judge set. 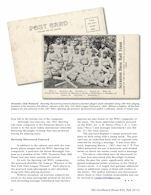 The resulting changes and additions to the book are provided to match the book format for easy updating. 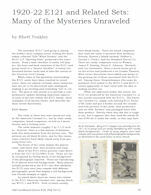 5) "1920-22 E121 and Related Sets: Many of the Mysteries Unraveled" by Rhett Yeakley. 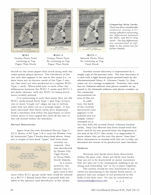 This set of only five known postcard foldouts is described along with fully expanded views of the player panels for all five cards. 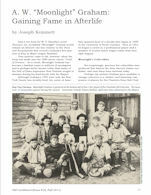 A complete checklist of players is provided for the first time for each of the five teams represented.